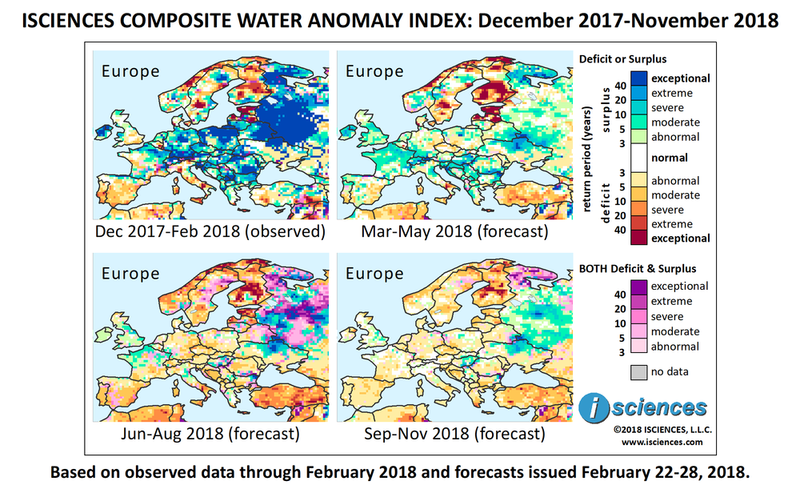 The 12-month forecast ending November 2018 indicates exceptional water deficits in Finland, Estonia, Latvia, along the Norwegian Sea coast, and a pocket in central Sweden. Deficits of generally lesser severity are forecast on the Iberian Peninsula, and in Sardinia, southern Italy, Sicily, Malta, and Crete. Surplus is forecast for Ireland, northern France, Switzerland, the Rhine River in Germany, northern Poland, Hungary, southern Serbia, northeastern Bulgaria, southern Romania, northern Ukraine and the Dnieper River, eastern Belarus, and European Russia. These conditions are expected to be exceptional in northern Poland, eastern Belarus, and Murmansk, Russia. In the near-term through May, water surplus in the region is expected to shrink and downgrade, leaving primarily moderate conditions. Surpluses may be intense, however, in pockets of Murmansk (Russia), northern Ukraine, northeastern Bulgaria, Croatia, and Switzerland. In France, surpluses will continue to emerge, spreading throughout much of the country. Exceptional deficits will continue to emerge in Finland, Estonia, Latvia, and a pocket in central Sweden. A band of deficit conditions will persist across southern Italy, but deficits will shrink and downgrade on the Iberian Peninsula – with some surplus conditions emerging - and also generally downgrade on Corsica, Sardinia, and Sicily. After May, the forecast indicates a transition away from surplus to mild deficit in Central and Eastern Europe, with more severe deficits in Northern Europe, particularly Finland and the northern Baltics. Moderate deficits will spread on the Iberian Peninsula and may be slightly more severe along Spain’s Mediterranean coast. Deficits will persist in southern Italy and will emerge in parts of the Balkans. Intense surplus conditions are expected to persist in northern Ukraine, and may re-emerge in European Russia along with conditions of both deficit and surplus as transitions occur. Surpluses may be intense in pockets of Russia and east of Kyiv, Ukraine. Conditions of moderate surplus are expected to persist in northern France and the central UK. The forecast for the remaining months – September through November 2018 – indicates mild deficit in much of the region, intense deficit in Finland, and surplus in European Russia. Winter storm Emma challenged large swaths of Europe recently with heavy snowfall and Siberian temperatures, killing 55 people across the continent. The frigid conditions were especially burdensome to the homeless, and nearly half of the deaths occurred in Poland. The canals of Amsterdam froze for the first time in six years. Around 2,000 drivers were stranded near Montpellier, France, some for as long as 24 hours. A number of Britons had to be rescued from 100 snowbound vehicles in South West England. In Sweden, the car carrying Prime Minister Stefan Lofven skidded off a storm-blown road north of Stockholm, crashing into a railing, though no injuries were reported. The Italian civil protection agency was deployed to clear streets in Rome, and the Royal Air Force was called to assist in Britain. Flights were canceled and delayed out of Ireland, Scotland, England, Switzerland, and France. Floods and landslides caused by heavy rainfall forced evacuation of several communities in Greece late last month and blocked shipping along the Corinth Canal. In mid-March, rainfall and melting snow caused flooding in Bosnia and Herzegovina, and in Croatia, where a southeastern river reached record levels. Albania suffered floods and landslides that damaged roads and inundated nearly 7000 acres of agricultural land and grasslands. The surplus of water from the European storms quenched drought-stricken regions of the Iberian Peninsula, increasing reservoir levels in Andalucía by more than 200 billion liters (52 billion gallons). Rainfall in southern Spain delayed blueberry and strawberry harvests, but was welcomed by the region’s horticultural sector at large, which has been suffering drought for the last few years. Anticipating the possible disappearance of the Alp’s glaciers within the century, a French hydropower firm is planning to increase by five-fold its capacity from wind and solar sources. Last year drought reduced the flow of the Rhône River - and the company’s electricity production - by 27 percent.